At the 2014 Geneva Auto Show Bentley unveiled its redefined Flying Spur W12 with a new badge; Bentley Flying Spur V8 2015. Delivering better fuel efficiency in compared to its predecessor this recent lease takes the company closer to buyers of brands like, Mercedes, BMW, Jaguar, and Maserati. Let us have a look at the review of Bentley Flying Spur V8 2015 to know more about its features and specifications. Interior f Bentley Flying Spur V8 2015 is as anyone shall expect from manufacturer like Bentley. The first thing that’ll steal all your attention is the monotone color split, that gives a beyond comparison luxurious touch and gets complimented further by the Dark Fiddleback Eucalyptus wood veneer. The model isn’t just about looks and comfort but also brings impeccable treat of technology. The first thing under this badge you’ll be noticing is the center console mounted touch screen remote. This allows the passengers at rear-seat to control the climate in cabin and simultaneously to operate the infotainment system. Not only this, as an option company offers you to get you interior of Bentley Flying Spur V8 2015 rolled out with Rear Seat Entertainment system. 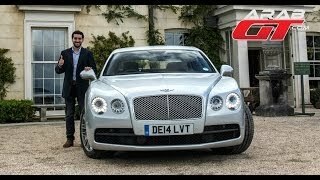 With the Bentley Flying Spur V8 you also get Mulliner Driving Specification, a feature that adds diamond quilting seats, knurled gear shifter, drilled alloy pedals, jewel fuel, perforated leather headliner, 4+1 rear seat with full adjustment and lumbar support, dark stained Burr, embroidered Bentley wings on the headrests and 17 upholstery colors. Unlike its interior, the exterior of Bentley Flying Spur V8 2015 is very identical to its predecessor. However you definitely can notice a few changes; starting with the front fascia, model portrays a red center on the winged badge, black finished bumper grilles and a black ‘wing’ insert. Moving towards the rear fascia there’s only one change and that’s with the figure-eight exhaust tips. 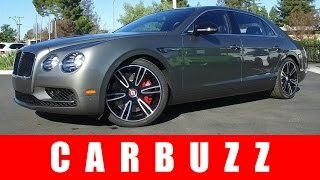 In all the exterior of Bentley Flying Spur V8 2015 doesn’t have any major noticeable change and brings in features and looks resembling to its elder sibling. Beneath the hood of Bentley Flying Spur V8 2015 is a 1.0 Liter twin-turbocharged V8 engine cranking total output of 500 hp and peak torque of 660 nm mated to ZF-sourced eight-speed autobox transmission. 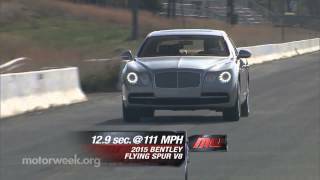 The top speed of Bentley Flying Spur V8 2015 touched mark of 183 mph while the 0-60 mph can be knocked in 4.9 seconds. The major change coming in this model is with the fuel efficiency which is 17 mpg (combined).